March Madness Friday March 22nd. Mr. Bellringer is tonight at 6:00 pm at the EHHS Auditorium and is looking to be a pretty fun show! If you’ve got nothing to do before the snow starts tonight, come spend an hour or two at the show. Tickets are $5 and proceeds will be donated to charities by NHS. High School Yearbook Ordering Deadlines Fast Approaching! 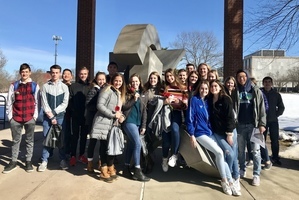 EHHS students interested in the field of business attended a risk and management workshop at the University of Hartford on February 14th. 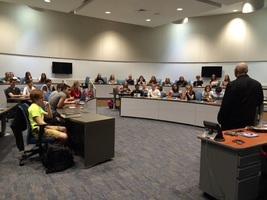 The day included information about risk management and insurance careers, a class simulation, and a campus tour. 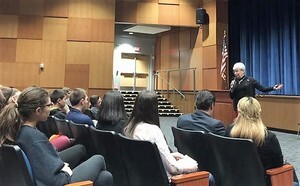 The workshop was sponsored by Junior Achievement and the University of Hartford's Barney School of Business. 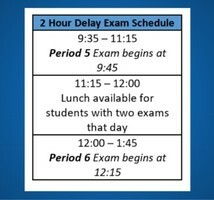 2 Hour Delay Exam Schedule in effect for Tuesday Jan. 22nd. 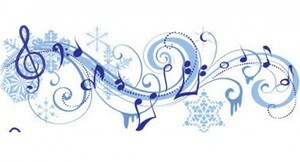 Tri-M Honor Society Recital TONIGHT! Come join us tonight at the Tri-M Music Honor Society Recital! 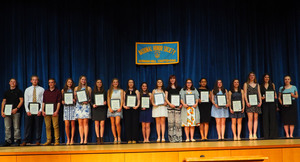 Wednesday, December 12h, from 7:00 pm to 8:00 pm at East Hampton High School Auditorium 15 North Maple Street Tri M Members will be performing select pieces. 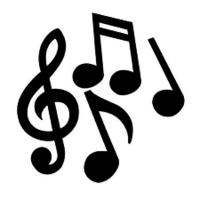 The Band and Chorus Concert scheduled for tonight has been postponed until Thursday November 29th, as all activities after 4 pm in the school district have been canceled for today, Nov. 15th.Please join us in 2 weeks! Same place: EHHS Auditorium Same Time: 7:00 pm. Just a new date. Come get your nails done for a good cause! 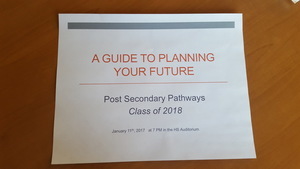 JUNIOR & SENIOR PARENTS: The Guidance Department will be hosting Financial Aid Night with Barnum Financial Group in the EHHS Auditorium at 6:30PM on Tuesday, September 25th, 2018. 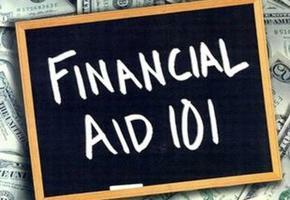 We hope you can attend this informative presentation on college financial aid & funding. On a beautiful summer evening, which also happened to be the longest day of the year we bid farewell to the Class of 2018. Congratulations! We are so very proud of you and will miss you! 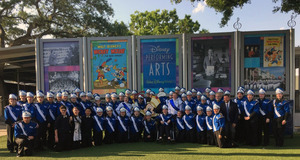 We are so proud of our music students, performing in concerts and participating in music workshops during their Spring 2018 trip to Disney. They have worked long and hard getting ready to sound their best. Many raised money to pay their own way on this trip. First to perform was our concert choir. Band will march in the parade tomorrow! Way to go Bellringers! 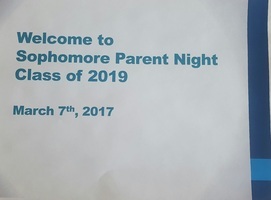 Reminder: Tuesday, March 6th @ 6:30pm Sophomore Parent Night in the auditorium hosted by the Guidance Department. 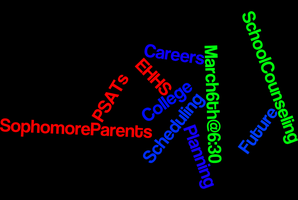 Topics to be covered: Junior Year SchedulingPSAT/SAT Score InterpretationHow to begin College PlanningAnd more… Parents and students are encouraged to attend! Congratulations Bellringers! Shoreline Conference Boys Basketball Champions! 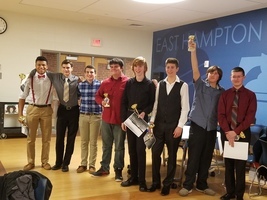 Congratulations to the East Hampton High School's Boys Basketball team for advancing to the Shoreline Conference Championship! 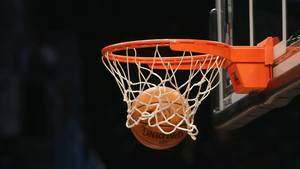 The game which was originally scheduled for tonight - Friday March 2, 2018, at Wilbur Cross High School in New Haven has been postponed and rescheduled for tomorrow, Saturday, March 3 at 7:00 pm. 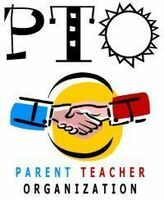 The High School is excited to welcome parents of 8th graders on Wednesday, January 31st at 6:30 pm in the High School Auditorium. 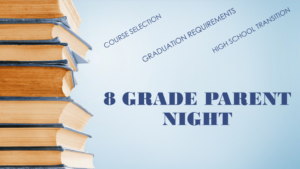 We'll be going over the transition from the Middle School to the High School; explore the offerings of the different academic departments and their course sequencing; as well as give an overview of Athletics, clubs and activities. 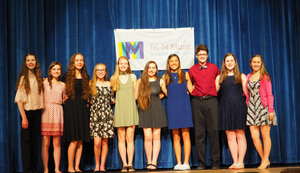 Tri M Music Honor Society Members and friends will be performing select pieces. Yearbook ordering now open online! 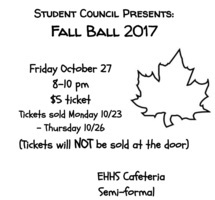 The EHHS Student Council is sponsoring a Fall Ball on Friday October 27, 2017 from 8 - 10 pm. You must purchase tickets in advance, they will not be available at the door. Get ready to get your groove on at the first dance of the year! The High School kitchen is taking delicious to a whole new level!!! 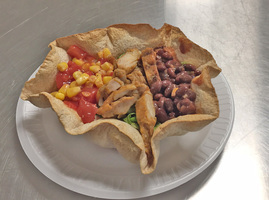 Today's High School lunch offering included this tempting taco salad with grilled chicken, fiesta black beans and homemade corn and tomato topping. All this deliciousness was presented in a crispy taco bowl that the kitchen staff pressed themselves! 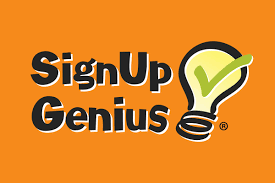 The October 28th ACT registration is open through October 6th. 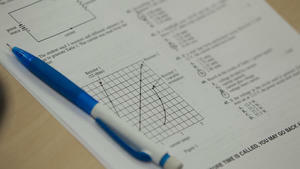 Please register on actstudent.org The Nov 4th SAT registration is open through October 5th. 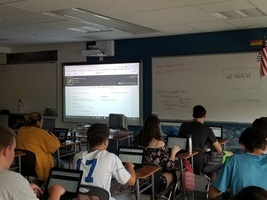 Please register on collegeboard.com Ms. Suhre and Ms. Malcolm are continuing to meet with all of the seniors and are available for any questions you may have regarding the college application process. 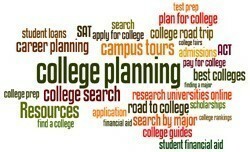 Just a reminder that tonight we will be hosting a Financial Aid/ College Funding Workshop at 6:30 PM in the Auditorium. All interested Junior and Senior parents should attend!! 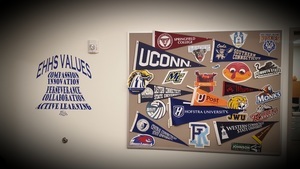 College rep visits resume this week! 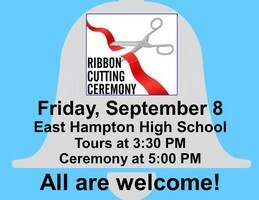 Ribbon cutting of the East Hampton High School on Friday afternoon. Tours at 3:30, Cutting of Ribbon at 5:00, Brief Ceremony at 5:15, and Refreshments at 6:00 PM. Join us for music from the Marching Band and Choir. 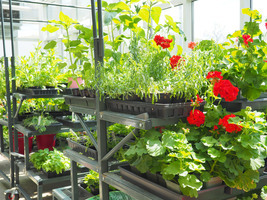 Take a tour - every classroom will be open! HS Fall Sports Registration Deadline is coming up! 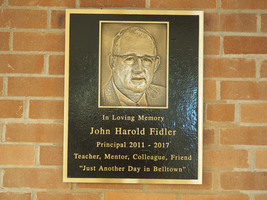 Our Teacher of the Year is in the News again! 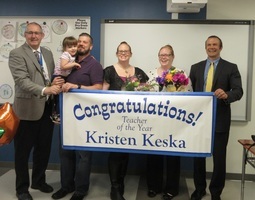 Kristen Keska has been announced as the East Hampton School District Teacher of the Year for 2017. We could not be prouder of her here at the high school. Congratulations Kristen!! 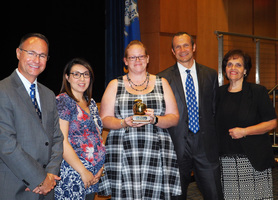 Congratulations to Kristen Keska, Social Studies Teacher at East Hampton High School who has been named the East Hampton Public Schools Teacher of the Year for 2017-18. 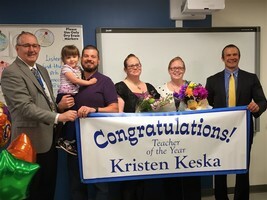 As East Hampton's Teacher of the Year, Kristen will be the district's nominee for the State of Connecticut Teacher of the Year. Kristen is pictured below with family and school administrators. 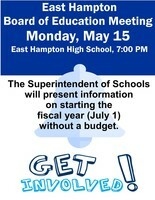 Parents and Community Members - please consider attending the Board of Education Meeting on Monday, May 15 - 7:00 PM at the High School! 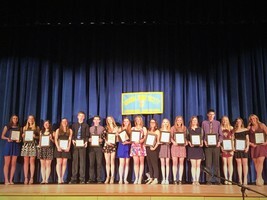 Congratulations to the newest inductees of the East Hampton High School Ferrigno-Bell Chapter of the National Honor Society! The annual CABARET NIGHT is this Friday! 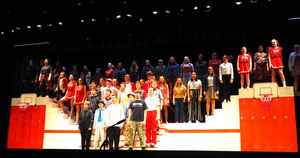 Come and enjoy the talents of East Hampton High School Students while you enjoy dinner. This is a night of music and food that you will talk about for weeks. 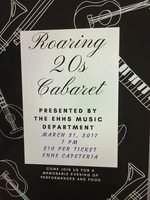 See you Friday, 3/31 at EHHS - 7:00 PM! 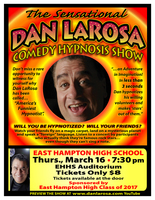 This Thursday, March 16th, renowned hypnotist Dan LaRosa will be in the high school auditorium at 7:30 working his magic on unsuspecting volunteers. See your friends act like they are on the farm, in rock band, or any number of other oddball situations. Tickets are $8, available at the door, and support this year's junior class. See you there! 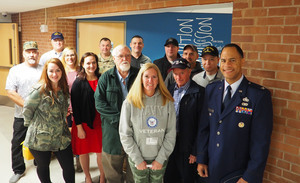 East Hampton High School was honored to welcome both Lt. Governor Nancy Wyman and Representative Melissa Ziobron. The Lt. Governor spoke to our Freshman Class. Mrs. Banack's Pre-Calculus class spent some time in the TBELL to close out last week. 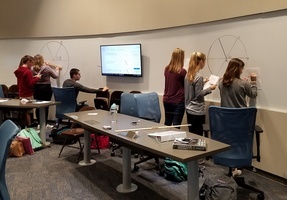 They completed a "Radian Measure Investigation Activity" and through drawing and taking measurements, students drew the conclusion that one radian was equivalent to the circumference of a circle divided by its radius. 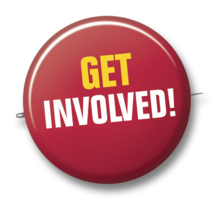 Get involved in the Budget Process! Parents and community members: Learn about the 2017-18 School Budget. Take a look at the Superintendent's proposed budget for 2017-18: http://bit.ly/2kbbWkj. 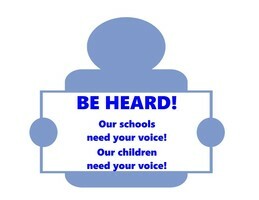 Then come to the Board of Education meeting on February 6 at 7:00 PM at East Hampton High School and express your opinions! Please be heard! 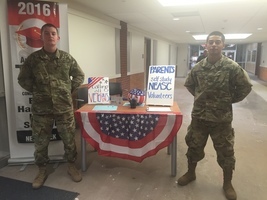 We want your input! 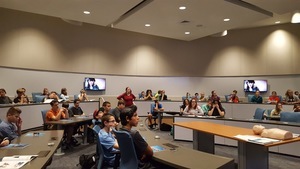 We were happy to have such a spectacular turn out last night for our 8th Grade Parent Night for the incoming Class of 2021. A big thank you to those of you who were able to make it! 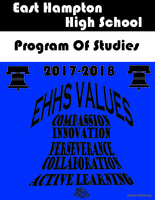 As promised, I have uploaded the power point from last night, 8th Grade Parent Night 2017 Please let us know if you have any questions, we are happy to help! 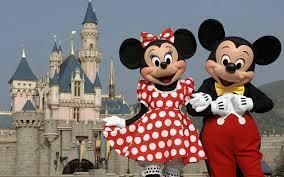 The East Hampton High School Music Department is holding a DISNEY WORLD - APRIL 2018 preliminary planning meeting for Monday, January 9th at 6:00 PM in the high school auditorium for all parents of 8th, 9th, 10th, and 11th grade music students. 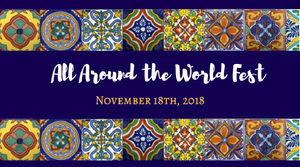 The meeting will include information about the trip next year and various fundraising opportunities that will be available. Thank you to the 8 Alumni who came today to speak to our seniors and share their words of wisdom! 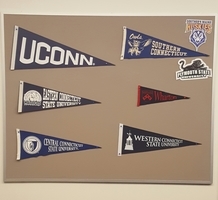 Our alumni were representing the following schools: UCONN, SUNY Oswego, University of Alabama, Eastern Connecticut State University, Suffolk, Emmanuel, University of Tampa and Fairleigh Dickinson University. 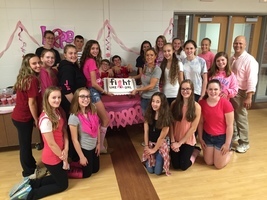 Spanish Club Gives Back Too . . . 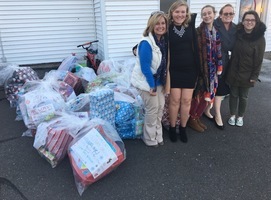 The Spanish Club also chipped in, volunteered, and did some fundraising, all to be able to give back and brighten the holidays for children in the Hartford area. 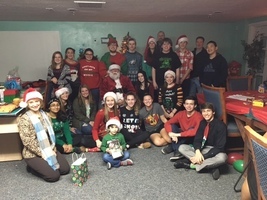 About 50 students participated in purchasing gifts, wrapping them, delivering them, and then spending quality time to make the season bright. 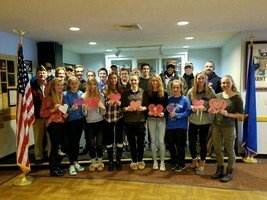 The Interact Club enlisted the help of the entire high school community to make the holidays a bit more special for 50 boys and girls in the Middlesex County area. 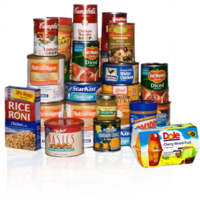 Students and staff across the school pitched in to purchase and wrap hundreds of items. Pictured are volunteers who made the final delivery of gifts to help brighten the holidays for others. 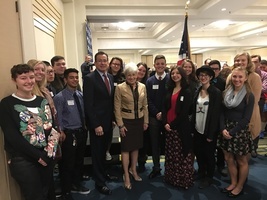 AP Government Students Meet Governor Malloy and Lieutenant Governor Wyman! 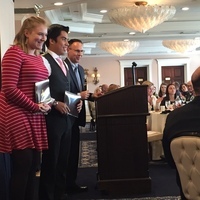 Today superintendent Paul Smith officially presented Molly and Hunter with their awards at the Middlesex Shoreline Superintendents' Awards Luncheon. See our Facebook page for additional photos. 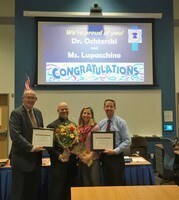 The East Hampton Board of Education recognized high school teachers Dr. Ochterski and Ms. Lupacchino-Gilson on the publication of their article, "Getting an A in STEM" in the national journal, The Science Teacher. Congratulations to both of them! 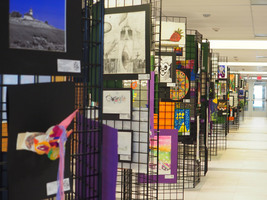 And, thank you for bringing East Hampton student work into the national spotlight! 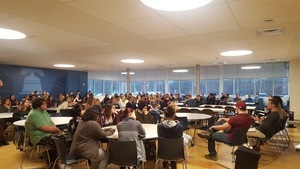 A big thank you to all of our Sophomores and Juniors who successfully completed their PSATs on Wednesday!Scores should be released via student College Board accounts in January! 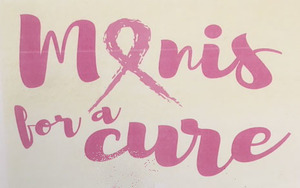 Manis For A Cure A Huge Success! 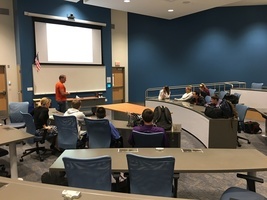 Today all students enrolled in Freshmen Health met for the first part of their CPR/AED Certification. These students will be practicing the hand-on components of their training next week. Recently a group of Principals from the Jilin Province of China spent the day in the East Hampton Schools. 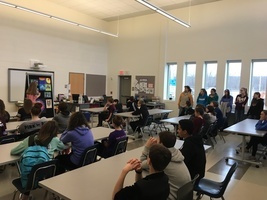 Featured as part of their visit was a tour of the new high school's programs! 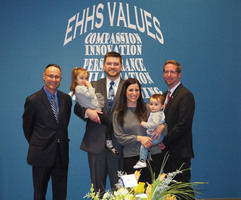 At the recent Board of Education meeting, Scott Burns was recognized as one the high school's Friends of Education Award winners. Congratulations Scott! 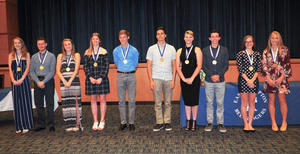 At the recent Board of Education meeting, Mark Laraia was recognized as one the high school's Friends of Education Award winners. Congratulations Mark! 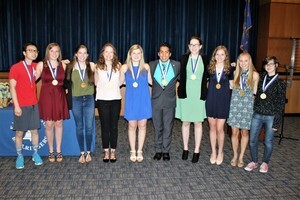 High School Friends of Education Award. At the recent Board of Education meeting, Bob Hein was recognized as one the high school's Friends of Education Award winners. Congratulations Bob! 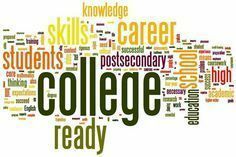 Just a reminder- Any seniors interested in taking the November 5th SAT must register online at collegeboard.org no later than next Friday, October 7th! Yesterday, the EHHS Rowing Club took to the water to launch the fall season. 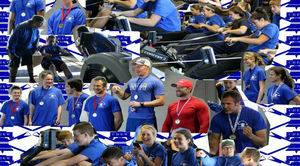 In its second year, the club is looking good and preparing for a full race schedule in October. If any student is interested in being a part of the club, see Mr. Dalton at the high school. 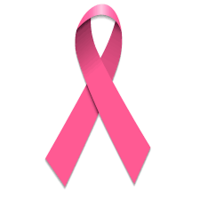 The October racing schedule will be posted soon. Check back for details,and go Bellringers! Senior English Presentations & the School Counseling Department using the TBELL for the first time! This afternoon the School Counseling Department had our first opportunity to use the TBELL. 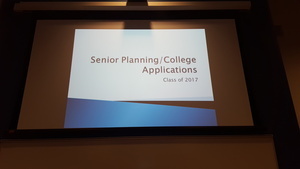 We were excited to present information regarding the senior process (post-secondary planning, college applications and more) to Mrs. Flannery and Mr. O'Donnell's 7th period classes!! More presentations to follow later this week. 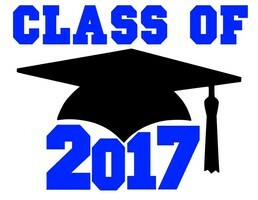 Underclassmen Picture Day this Friday, September 16th! 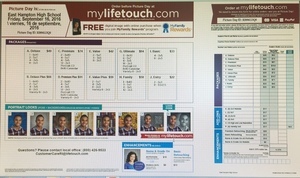 You can order your pictures online or print the form and bring it in on Friday. 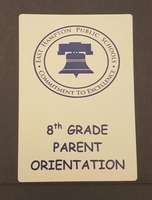 We are looking forward to welcoming the Class of 2017, the Class of 2018, the Class of 2019, and the Class of 2020 to the newly renovated East Hampton High School on Tuesday, 9/6! Have a great start to the school year!